The US has warned American female missionaries they are targets of terrorists in Egypt, where Christians are on the run from Islamists. The United States has warned American female missionaries that they are targets of terrorists in Egypt, where Christians are on the run from Islamists. “The Embassy has credible information suggesting terrorist interest in targeting U.S. female missionaries in Egypt,” a State Department travel warning stated. It added, “U.S. citizens should exercise vigilance, taking necessary precautions to maintain their personal security." The warning follows by six weeks a general warning to Americans on travel to the Sinai Peninsula, following an Israeli waning of an imminent terrorist attack. The following day, the IDF foiled a major attack on Israelis after terrorists killed 16 Egyptian border guards and crossed the border with Israel. The Coptic population is estimated to comprise nearly 10 per cent of Egypt’s residents, who have suffered numerous attacks during the past few years. Churches have been torched and dozens of Copts have been murdered since the ouster of Egyptian President Hosni Mubarak in the Arab Spring revolution last year. 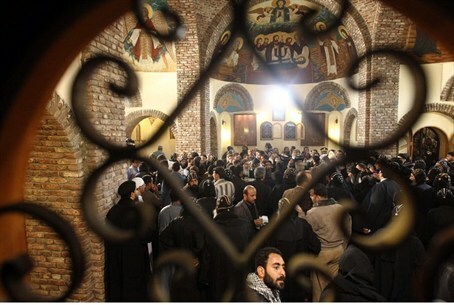 Last month, Muslims attacked a Coptic church in a village near Cairo. At least 16 people were wounded in the melee, among them 10 police officers. Copts reportedly have fled their homes in the Sinai Peninsula, where Bedouin tribes along with Hamas and Al Qaeda terrorists have carved out areas of control in a power vacuum left by the Egyptian Army. Egypt’s Prime Minister Hisham Qandil denied the report on Saturday, stating that “instructions given by the Egyptian authorities is [sic] to protect the Coptic brothers wherever they may be." Father Mikhail Antoine of El-Arish church told AFP that, "the families moved voluntarily because they feared for their lives after the threats."